To win a race, power is of the utmost importance. 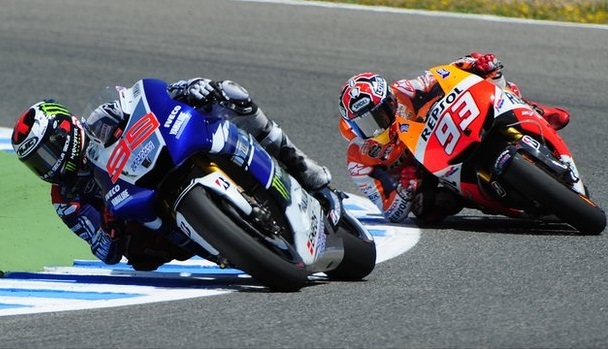 The Moto GP has had its share of contention regarding how much power is feasible. There is, of course, a price to be paid for generating that amount of staggering power. Essentially, the power that an engine can generate is almost limitless. Theoretically, at least. However, there are a number of designing constraints. The machine has to meet some real-world standards and limitations. There is weight to be considered. Then there is fuel efficiency. In a world which is consciously trying to become more fuel-efficient to conserve the rapidly declining limited reserves of fossil-fuel, an oil-guzzzling, powerful, fast and furious machine is not a tempting treat even for the most die-hard race fan. More than a decade ago when the Moto GP was entering a new phase in its history, the four-stroke engines replaced the two-stroke engines. The four-stroke engine was more powerful. However it had the handicap of being heavier. It was also less efficient. A further limitation of engine capacity was imposed—a reduction from 1000 cc to 800 cc. Very soon a weight restriction was also imposed. Major issues arose regarding maneuverability and driver safety, and the possibility of Moto GP becoming less than spectacular. With advancement in designs, power was restored to engines. Dramatic changes in piston bore, material of construction, super-refined fuel and other mechanical refinements produced efficient and powerful engines. However, after considerable deliberation and debate, the displacement capacity was increased to 1000 cc again. The maximum bore diameter is restricted to 81 mm. The minimum weight allowed currently is 158 kg. To reduce weight, the use of ballasts is allowed. A four cylinder, four-stroke V4 or Inline four engine is used. Two-stroke engines are no longer allowed. To achieve maximum power and fuel efficiency, unleaded 100 octane fuel is used. The power achieved is a staggering 240 bhp and the highest velocity of 350 km/hr. The fastest human, Usain Bolt, ran at a record speed of 45.7 km/hr. So much for perspective! Apparently limitations are aimed at restricting unlimited power. This prevents prominent manufacturers who can invest significantly in research from running away with the rewards and glories. However the solutions are equally daunting and before it becomes cost-effective enough for smaller teams to implement, the stronger teams have already raced ahead. Still, over a long period of time these compromises have allowed outsiders to make some mark on the scenario. At present, the current designing standards represent the best compromise between power, weight and fuel efficiency. Despite these intricacies, the overwhelming appeal of power and speed of man and machine together continues to draw millions of viewers. The Grand Prix remains a showcase for the heights that imagination and technology have achieved—which remain the true sources of power. Next Next post: ISL 2015 Finale – Who will get crowned?